Workers at the Chiatura mines in western Georgia toil in abysmal conditions. Strikes, puppet trade unions and a reluctant government have all failed to improve their lot. It’s been eight years since Leila, in her forties, started work at the enrichment plant of the Shukruti mine in Chiatura, a manganese-mining town in western Georgia. At first, Leila supervised deliveries to the plant for further processing, but these days she must stand by machinery filled with wet manganese ore at a strip mine. Leila’s job is to remove rocks and wood, otherwise they get stuck in the sorting machine and the machinery will have to stop. She could even be fired. Although Leila’s workplace is on the sixth floor of an eight-story building, it is raining inside. There are giant holes in the roof, floor, walls—almost everywhere. As she is in regular contact with water, Leila may not use an electric heater. Instead, Leila must make do with a wood burner, but though no-one brings her the wood). Instead, she uses what she finds among the manganese ore, though it gets pretty tough in windy weather. Manganese extraction was launched in Chiatura more than a century ago, and the town’s seven functioning mines are currently owned by Georgian Manganese Ltd., which was sold to Georgian American Alloys in March 2013. Elderly workers remember Soviet times like a fairy tale: a good salary, reasonable working conditions, proper holidays. Over the last few decades, regimes may have changed and owners of the mines and local governments have come and gone, but nothing changes for the workers. At least six mine workers have died over the last two years due to poor safety conditions here in Chiatura. Even more have been injured. Accidents are blamed on the victims: no one is punished. After Mikheil Saakashvili’s UNM (United National Movement) came to power after the fall of Eduard Shevardnadze in 2003, among other well-known reforms, the new government began to make changes to the labour legislation, handing more rights to employers and reducing those of employees. Meanwhile, the country’s labour inspectorate was shut down due to corruption. At least six mine workers have died over the last two years due to poor safety conditions in Chiatura. CC: Marco Fieber via Flickr.Indeed, Georgia is one of the few countries in the world that doesn’t have a labour inspectorate to oversee and maintain working conditions (safety, hygiene, equipment and machinery), and ensure that labour legislation is being observed. Lela Gvishiani, a lawyer at Georgia’s Education and Monitoring Center NGO, says that though the old labour inspectorate may have been corrupt, the number of deaths on duty has dramatically increased in the years following its closure. According to official information from Georgia’s Ministry of Internal Affairs, over the last five years 202 people have died and 447 have been injured at work. One of the major problems of the amended labour code was Article 37, which gave employers the opportunity to fire employees at any time, without explanation or warning. It was useless to go to court and fight for any rights. Although the code recognised certain extra working hours and the existence of heavy, harmful and hazardous labour, the code did not determine any limits or obligations on the part of employees. Compensation for extra hours, allowing workers to take a holiday as outlined in the legislation or extra pay for hazardous work—all this depended on the good will of the employer. Tamaz Dolaberidze, leader of the Metallurgical and Mining Industry Workers’ Union, says that after the new government amended the labour code in 2013, there were some improvements, but nothing changed in terms of safety and security. In 2013, it was decided that certain mechanisms were necessary before the newly amended labour code could be implemented. Firstly, a mediation service was to be established in order to resolve labour disputes, and secondly, a new labour inspectorate was to be created. Dolaberidze explains that the inspectorate is yet to appear, but every time a labour dispute arises, the Ministry of Health, Labour and Social Affairs appoints a mediator, while a sub-department for monitoring labour conditions operates instead of creating a proper labour inspectorate. This body has very limited authority. If a company wishes, it can invite this department to inspect its workforce’s working conditions. But after inspection the sub-department can only give recommendations: the company has to decide for itself whether to heed them or not. Georgia’s Ministry of Health, Labour and Social Affairs, however, is pretty optimistic about its new department. Elza Jgerenaia, head of the Ministry’s Labour Department, gives assurances that Georgia will have a proper labour inspectorate that can fine employers for violations and function as a proper punitive authority. Twenty five monitors are currently being trained as future labour inspectors for the ministry, but they will require legislative grounds in order to carry out supervision. ‘Right now, [supervision] is voluntary. That’s not a secret. These people aren’t yet well qualified. They are being trained right now,’ says Jgerenaia, adding that several companies have expressed interest in being inspected. In Chiatura, a town with a population of 20,000, up to 4,000 people are employed in the mining industry. CC: Marco Fieber via Flickr.Elza Jgerenaia states that the government is currently drafting the legislative basis for a new labour inspectorate and is holding consultations with lawyers, experts from the EU and trade union officials. Meetings have also been held with company representatives, who are curious about the new inspectorate. They want ‘to be prepared’. But even if companies are warned in advance, it would take years to eliminate all or even some of the violations at the plants and mines in Chiatura—a revealing example of how even the basic requirements of the law aren’t being followed. 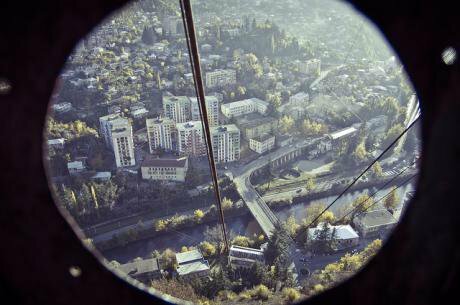 For 15 years, Lasha Ghughunishvili has operated a cable car taking miners to their workplace. He works a 24-hour shift every four days. Water leaks into the cabin. There is no heating, and sometimes no lighting. ‘Once I asked my supervisor if we could change the light bulb,’ begins Lasha. ‘He said the entire company has only 20 bulbs, so he couldn’t give me one. Imagine, a company which earns billions!’ Lasha adds that workers are often forced to bring their own brooms and bulbs, as well as other tools such as screwdrivers. 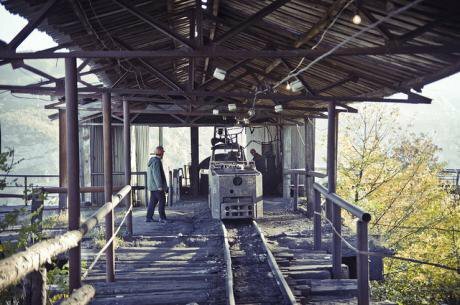 In Chiatura, a town with a population of 20,000, up to 4,000 people are employed in the mining industry. In some mines, workers have to walk over six kilometres down tunnels lit with only two or three light bulbs— there is no alternative means of transport. There is no ventilation, either. Sometimes, a miner will have to walk some distance back just to light a candlestick and bring it back to resume digging. In some tunnels, there is not enough oxygen. Enrichment plants—like the one where Leila works—have no bathrooms. If she needs the toilet, Leila must wait for an electrical engineer to turn the machines off for her: she is the only one working there. It is the same on every floor. One person does the job of at least five. If, in Soviet times, 5,000 people were employed in the Shukruti mine alone, today Chiatura’s seven mines have far fewer workers between them, none of whom have a contract with the company. Giorgi Neparidze worked Shukruti mine for ten years before he was fired for his trade union activity. He says that, throughout his entire time at the mine, he cannot remember anyone from the government coming to inspect working conditions in Chiatura. The mine administration has a special service that is obliged to carry out an inspection on a weekly basis. Lasha and Giorgi say that it usually overlooks all violations; sometimes it ends up holding a feast instead. Vakho, an electricial engineer who has worked in Chiatura for ten years, says the administration forces certain workers to do jobs that they aren’t qualified for. For example, the workers remember a story when a wagon was derailed. It was not the carriage driver’s duty to fix the problem, but he was forced to deal with it without any assistance. He ended up losing a finger, and the administration blamed him for doing unnecessary work. In such cases, workers can be fined GEL 5,000 (£1,354), while the average monthyl salary in Chiatura is GEL 700-800 (£189-216). Manganese extraction was launched in Chiatura more than a century ago, and the town’s seven mines are currently owned by Georgian Manganese Ltd. CC: orientalizing via Flickr‘Whoever reads the labour code must be insane. All governments care about investors. You know Georgian Manganese was fined more than $360 million [£233,500,000] for damaging the environment. It hasn’t paid single tetra [Geo: penny], and even if they had, Chiatura would see no benefit from it,’ says Giorgi. Chiatura’s workers are represented by three trade unions. One, with roughly 400 members, is affiliated with the Georgian Trade Unions Congress. Its members are often harassed or even fired if they are too active. Another has more than 1,500 members and was founded by the mine administration. This union carries out none of the tasks a trade union should. Members contribute one per cent of their salary each month, after which the union hands out 100 lari (£27) assistance on a selective basis. The town’s third trade union, however, started life as the organisational committee behind the massive 2012 strike following the victory of Georgian Dream at the parliamentary polls. Hoping that the new government would pay attention to their plight, Chiatura’s miners were emboldened and decided to stand up for their rights. The strike lasted for weeks. Some workers went on hunger strike two kilometres inside the mine. The workers won several concessions, and part of their salary was increased. However, after the administration increased the miners’ monthly quota, they didn’t really benefit from their pay increase. As for conditions, the administration refurbished a bathroom at only one plant, which it then shut down. Should someone ever come to see the conditions in Chiatura, the administration will solemnly open the refurbished bathroom to prove that conditions are fine. In reality, most bathrooms have no windows—women’s bathrooms are like a freezer in winter. In the years since, the organisation committee from 2012 has also turned into an administration-controlled trade union. Workers have lost faith in the Georgian government. Now they dream of the good old times. They don’t believe new amendments can bring positive change for ordinary people in Chiatura. In fact, they cannot imagine what could possibly influence the company to improve working conditions. A short-lived strike in February 2014 yielded no results, and only justified their cynicism. Workers cannot imagine what could possibly influence the company to improve their conditions. Tamaz Dolaberidze and Lela Gvishiani, the lawyer and union official, believe that if Georgia’s government succeeds in creating the proper legislative basis for a labour inspectorate, then the current grim picture could really change. Gviashiani believes that the new government hasn’t changed its attitude towards investors, and does not want to ‘scare them away’. Chiatura is no exception. 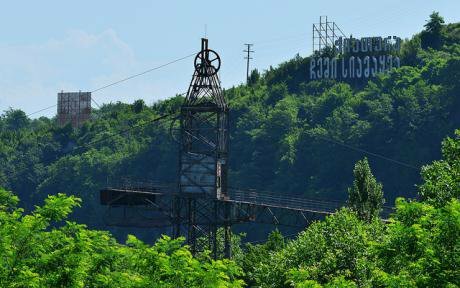 Across the country, there are number of plants and factories, which deal with the same kind of problems—from the metallurgical plants in Rustavi to the ferro-alloy plant in Zestaponi (which belongs to the same owners as in Chiatura), RMG Gold and RMG Copper in the country’s south or the coal-mines in Tkibuli. To this day, Georgia has not ratified a single convention of the International Labour Organisation.